Often I hear landlubbers ask what is a dinghy, so here is a quick note telling you about them. A dinghy is a small boat used to transport people to shore or other boats from their big boat. Captain James and Mrs. Little’s dinghy is an 8 foot long inflatable dinghy made by Achilles. 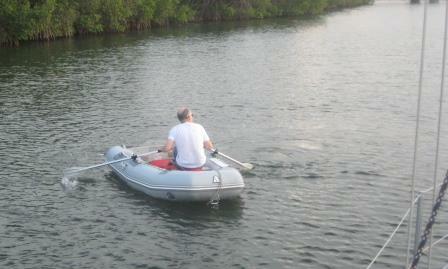 They have a 6 horsepower outboard engine that they put on it, or we can also row using the oars. Like any boat I have to wear my lifejacket, and they are required to carry lifejackets for everyone on board as well as other safety equipment like oars and a flashlight if traveling at night. When we began our travels, we carried the dinghy on the forward deck. Now that we are using it often, we tow it behind us with a rope called a “painter.” They have special words for everything on a sailboat. As an aside, once a rope comes onto a boat it is not called a rope anymore. It is called a line. And when that line is attached to a sail, it is called a sheet. See, Mrs. Salyer I am increasing my vocabulary! 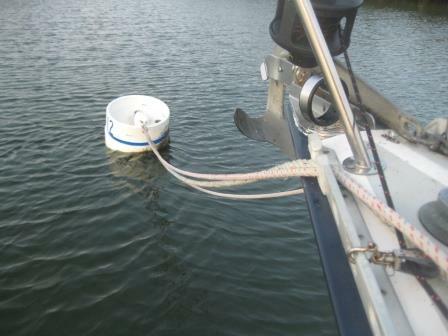 The dinghy is essential if you are going to anchor out and when want to go ashore for food, showers, shopping, etc. It is very expensive staying at marinas. They charge you by the foot. Mrs. Little keeps promising to take a picture of me in the dinghy, but she’s usually holding on to me tightly and is afraid to let go to use her camera. She thinks I might just pop out of the boat. It can be a little bouncy, but it sure is fun!!! Here is a picture of it being towed. This entry was posted in Cubby's Adventures. Bookmark the permalink.